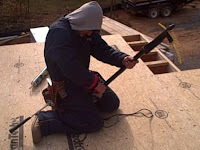 Asheville Framing and Building: Asheville Framing & Building has the tools we need! Asheville Framing & Building has the tools we need! Here you can see one of Asheville Framing & Buildings men attaching an extension to the screw gun to screw the floor sheathing down. We make sure our men have the tools to complete the job. We understand that many phases of a project cannot be completed with out proper tools and safety equipement. We ensure that all of our men are properly trained with the tools that they are using.